Fresh Madagascar vanilla beans ground to a fine powder. No additives. No artificial ingredients. 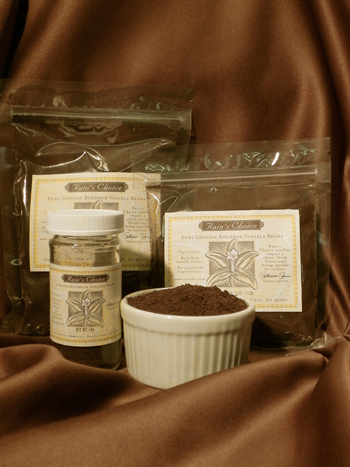 Just pure ground vanilla beans. Non-GMO. Gluten-free. Scroll down for Culinary Tips. One-half teaspoon of pure ground vanilla bean powder is approximately equivalent to one teaspoon of pure vanilla extract. Ground vanilla bean powder is a great way to add flavor to foods and beverages while avoiding alcohol or sugar. It’s just a straight-forward, flavorful powder that packs a punch! Substitute ground vanilla bean powder for vanilla beans in ice cream, custards, sauces — both sweet and savory — and baked goods. To layer flavors, use a base of ground vanilla bean powder and add a splash of vanilla extract to round up vanilla notes.